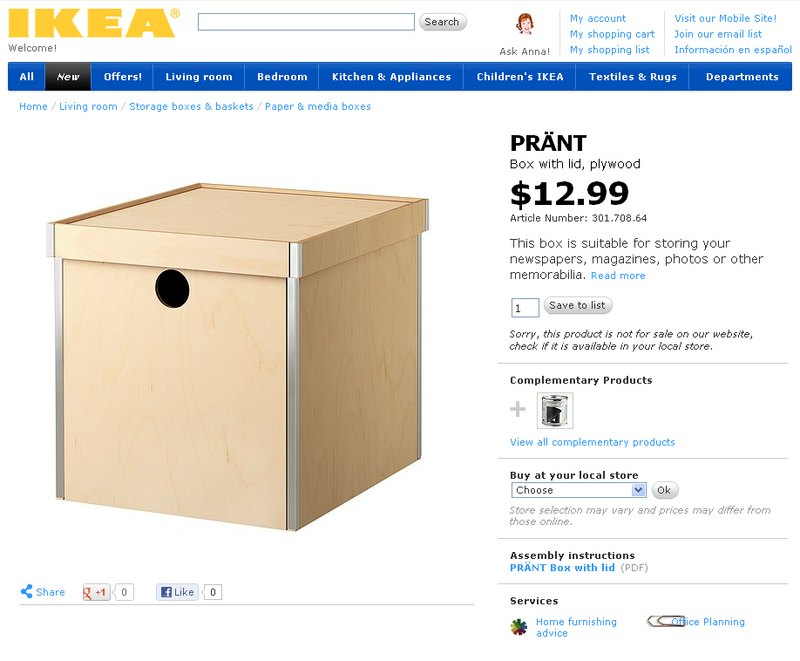 Do you love Ikea? I do. And, no, this is not a sponsored post. I just want to share a project I did that helps me with my storage issues. We are currently renting a rather small town home. 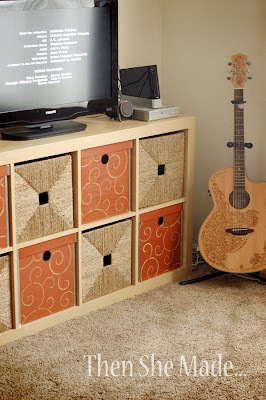 It fits our needs but finding storage space is tricky. Especially for, ummm, all my craft stuff. I have craft stuff stored under the bed, in closets, on top of cupboards and in my living room. I have more craft items than I do clothes - no lie. Fortunately, I've been pretty good at keeping it concealed so if you came into my home, you wouldn't know that they were craft supplies. Here's one of the ways I did it. Last fall I stocked up on Ikea Prant boxes. Have you seen them before? 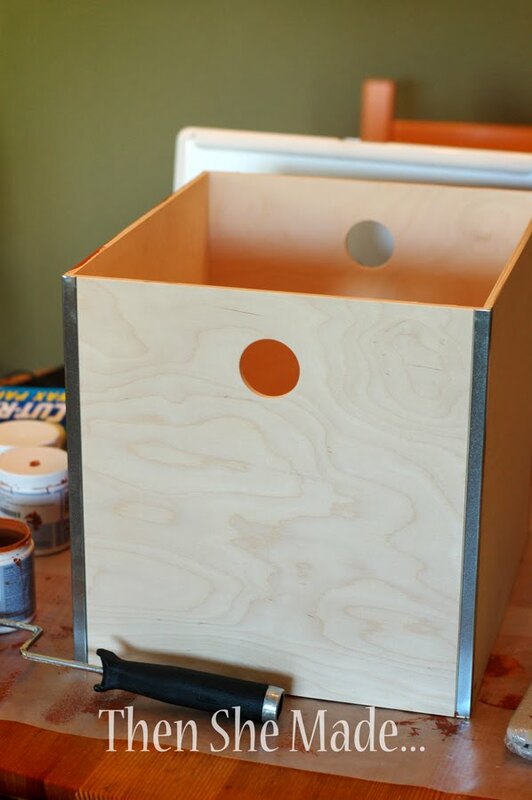 These are wooden boxes that come with a lid and have cool metal sides. You do have to put them together but they are pretty easy as you just slide the metal pieces into little tracks on the wood. They come in various sizes, I bought the big ones, I think they are like 13x13 or something like that. I went with these boxes mostly because of the lid. A lot of the baskets and storage bins are open top and you can see all the stuff inside. I have some of those, and while I like them, I needed some of them to have lids. Plus, these boxes are sturdy and can hold heavy things like clay. After they were put together I took the unfinished box and taped off the metal edges with painters tape - sorry, I don't have a photo of that. 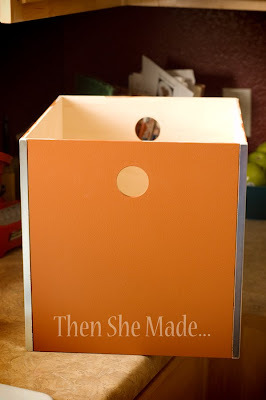 Then I painted the all the boxes - I'm kind of on a warm, muted orange kick so that was the color I chose. I love it! Next I took a large wall stencil that I picked up at Hobby Lobby, it was on sale for 50% off - wahoo, I love a bargain - and I placed in on the box. Then took a lighter orange paint and stenciled on a the swirl pattern. Here is it with just the orange swirls. 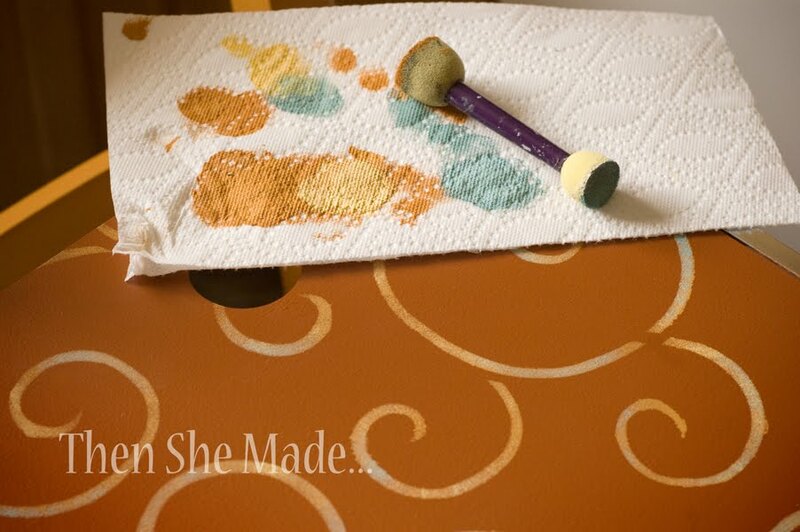 Then I took some other colors that are in our home like yellow, blue and green and I add them to the swirl designs. 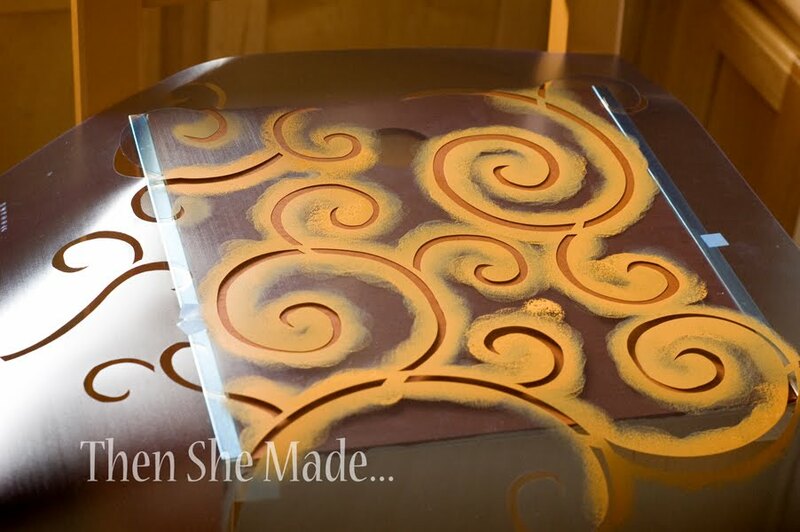 Just a little bit of color was added as I wanted most of the color on the swirls to be orange. And that's it. It was a simple way to personal some storage boxes. Then I filled up the boxes with some craftin' supplies and put them in their place on the shelf. Seriously, they hold so much. I have jewelry supplies, clay, stamps, fabric, ribbon, shipping stuff, etc... plus, my kiddos have a box (Wasn't I so nice to give them one box?) for their Wii stuff. It's all in my living room, easy to get to but nicely hidden. Hey, just a reminder that I still have several items up for grabs in my Etsy shop. I'm working up another deal of the day so I won't be recreating some of the items currently in my shop. So, if you've had your eye on something, you should grab it now. Go here: Then She Made Etsy Shop to see all that is available. You, my girl, are an institution!! 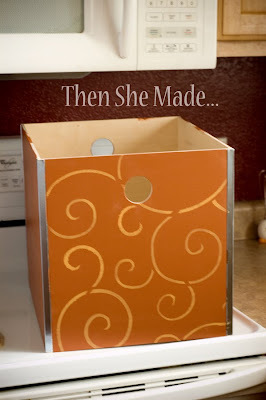 Always a fabulous idea on your blog! Just wondering, could you paint the wood first before you assemble the boxes? Love the idea.